We forged a close bond in an unusual way. It was those long car commutes to and from my corporate job many years ago — I on my cell phone and she on her home phone 1000 miles away in southern Florida. We shared thoughts and experiences, and chatted about family — and we laughed together, my mother-in-law and me. Because we lived so far apart, these caring and joyful conversations kept me company on those tedious (and sometimes stressful) trips in rush hour traffic. And it was the only way I got to know her in a more personal way after my husband and I were married and blended out families together. Then the years passed — many years — and we all grew older. My MIL (mother-in-law) is now elderly, infirm, disabled. She is legally blind, hearing impaired and mobility impaired. Certainly many challenges. She reluctantly agreed to give up whatever little independence she had down in Florida and move up to an assisted living nearby to my home, so that my husband and I could help care for her. Right before she moved here, we prepared for her arrival very diligently and happily — furnished her bright, lovely suite and made it as welcoming as possible. We believed that being near to family — particularly the great grandchildren — would be uplifting to her. We were looking forward to having a close relationship with her. We had no idea what the reality would be — and now it is 14 months later and the “honeymoon” is certainly over! The actuality of her negative, stubborn personality has been incredibly difficult for us. As joyful, as positive as we have both attempted to treat her — there is absolutely no joyful response and no appreciation. She is solely self-involved, with extreme focus on each disability and each pain she feels. The constant barrage of negative energy has shaken me to the core. However, I always consistently remind myself that yes, I do love her, despite these challenges. And every once in awhile, on a special outing or maybe when the inspired mood catches her, she might light up a bit and almost seem to have a glimmer of happiness in her countenance. I wish that would be more of the norm! On the up side, MIL has finally become involved in some of the activities at her facility so that provides some minor busy-ness and interaction for her. And for that I am grateful. However, the new challenge is that it appears she is at the beginning of some dementia, so on top of that challenging personality, we now have some mental decline to deal with. We cannot believe anything she tells us anymore, even though she states all things as if they are absolute reality. My husband has waning patience — he works full time in the city and has limited time and energy to spend with her — and with her attitude in general, it is not conducive to encouraging him to want to spend time with her. It is a sad situation for both him and me. My resolve as we entered this current year was to step back from the judgmental, self-centered world in which my MIL lives. Sure, I always cover my responsibilities and I provide care. Emotionally, I am remaining more aloof — for it is too easy to be overwhelmed with her constant drama. Is this a clear illustration of “the best laid plans, etc.”? Sometimes as much as we do set goals, as we do make every positive attempt to help someone, they are not receptive to us. We might think our joyful intentions, our heartfelt drive is so powerful — how can someone not get caught up in the wave of our optimism? Believe me, there are obviously those that ARE unresponsive, those who make the personal choice to wallow in negativity, turbulence and victimhood. That is truly a depressing life choice. We all have a choice about how we react to life — the sad thing is that many do not realize this. They remain unawakened. And another lesson in all this is that powerful reminder that you can’t change anyone else. The only one you can change is yourself. That lesson keeps hitting home… But with my MIL, I was not trying to change her — just encourage her to be a bit more in the flow of peace and adaptability. That is definitely my sincere wish for my MIL — peacefulness and acceptance of what is. Also, when it is her time (and I believe this is still far into the future), I truly pray that it will be quick and painless, and maybe she will just pass gently one overnight when her soul is ready to begin the next leg of her spiritual journey. As for now, we will continue to give her love as best as possible. I strive to remain patient and non-reactive with challenging people and situations. I let kindness and compassion flow to others, with positive intention and a pure heart. When challenging people and drama arise, I make sure to take care of myself in a nurturing, caring way — and remain peaceful within! Do you make time to have fun? I mean the downright pure, tune-in-to-your inner child kind of fun? A recent personal experience served as a clear reminder that maybe I do not always take enough time to indulge that youngster that resides deep within. I attended my grandson’s third birthday party at a trampoline-activity place. I had been looking forward to this for several weeks because the whole thought of it had rekindled a very distant memory from my own childhood. When I was about five years old, my mother took me to an outdoor trampoline place which was a bare-bones type place — trampoline material stretched over openings in the ground, all surrounded by cement or stone. Probably totally unsafe – but I spent time jumping with childish delight. It was my first time on the trampoline and I thought it was the best thing in the world. I remember how happy my little heart was! I couldn’t wait to go back, but unfortunately the place closed down to make room for some other construction. My newfound fun disappeared and I was sorely disappointed. Across the years I don’t remember too many opportunities to jump on a trampoline — maybe at some point with my own children when they were younger, but I do not clearly recall. Fast forward to last weekend and I found myself at the most glorious, colorful state-of-the-art trampoline facility. And of course, I also found myself much, much older than my last recollection of jumping on a trampoline! 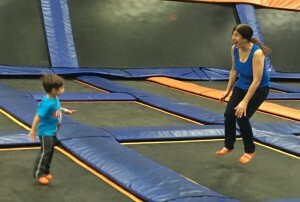 I hoped to jump with my grandson, but it turns out there were so many rules and restrictions. The petulant little child within me decided I really wanted a jump so I had to speak with someone who was in charge at the facility, and finally worked it out that I was able to purchase my own jumping pass — and sign a liability waiver, of course. 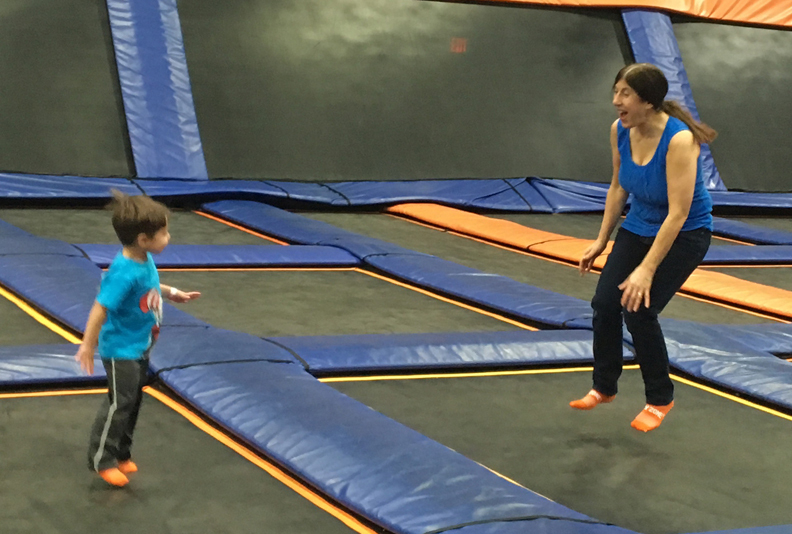 And suddenly — almost magically — I was on this huge area of trampolines, jumping and turning and running around with my grandson. It was such a strange but nearly euphoric sensation. My daughter captured my exultation in photos and I am grateful for that. I was definitely the oldest person who was jumping. Though I had some surprised glances from others who were my age and standing on the sidelines, I felt very smug and very free. And I personally, I don’t care what other people thought. I was having FUN! My grandson appeared delighted that one of the older folks joined him on his spree of joy. For children — those pure little souls — know how best to be in the moment with great joy! I know we always learn by contrast about what we do like and what we don’t like here on planet Earth. For me, this bubbly experience was a powerful reminder that we need to take a “fun break” from the mundane and ultra-busy parts of our lives to really experience that grand JOY of living. For sometimes we tend to just go through the routine motions of our everyday patterns and then wonder why we feel stuck or down. It is so essential to reconnect with that happy-go-lucky child that I believe still does reside in all of us. So if you have the opportunity to do something a little silly, or a bit “outside the box,” seize that moment! And if you don’t generally have these opportunities, then you need to make time for them or seek them out. For you absolutely need to create fun and optimistic moments in your own life. Yes, sometimes it is too easy to simply view life as a string of challenges — and occasionally that is exactly what our own perceptions tend to fall into. However, not ALL of life is challenging. I like to think of our journey as a “grand adventure” filled with a broad range of experiences and a wide variety of emotions that flourish within us. But it is up to us as individuals to focus upon and explore those experiences that are unique, fun and enriching for us. And when you have those opportunities to really stretch outside your little comfort zone — and help you connect with that uplifting, curious child within — then go for it! I make time for fun and uplifting moments in my life! I view life as an enriching adventure and I learn from the contrast of my varied experiences. I strive to nurture my inner child, for I know that this is a most joyful and healthy way to be! Every day — or almost every day — the Walker passes by. Solitary. Purposeful in his step. He has been striding through the neighborhood for as long as my husband and I have lived here, which is seventeen years. I do not even know his name or where he lives. He is focused on some inner screen as he never acknowledges anything outside himself. Never says “hi” or “how are you doing” — or even casts an inquisitive glance in my direction. Never notices the blooming of the flowers and greenery in the spring, nor the falling of the leaves in the autumn. Not seeing anything else but the road directly in front of him. Looking almost as if propelled by some unseen force. He is a puzzle, an enigma. Why is he out walking in such a driven way? Is it for his health? I almost get the feeling that if he stops this ritual, he will just cease to be. Perhaps his doctors told him he must walk, as an antidote for some cardiac condition. Or perhaps he walks to escape something — some difficult but ongoing family situation, spouse, partner? Or maybe he is simply mentally disabled or challenged — somewhere in the autistic spectrum. In reality, I have no clue. All I know is that as long as the roads are walkable, he is there, passing by my house. When I first moved in, he was more rotund, and I thought perhaps he was walking simply to shed some pounds. Yet, over the years, he has slimmed down and now he is actually skinny. His legs are like pale sticks and where he used to walk with a spring in his step, now he is slower, slightly unsteady. He looks as if he is walking bowed, his spine beginning to curve with age. I can only assume this will grow even more pronounced in the time to come. The Walker is becoming an old man. I can’t help but wonder — why does he walk so steadfastly? And why does he not acknowledge or connect with anyone? How does one remain so inward-turned, so oblivious to life happening around him? When we first came in contact with him, we tried to connect — made efforts to meet his gaze, say a soft “hello,” but he cast his eyes away, pretending not to notice. Or maybe he truly did not see us with any focus, as he is stuck in his own strange world. Yet how does he go through his days as a Walker, without partaking in the Life happening gloriously all around him, without enjoying the companionship of others? To me this is incredibly sad. Am I too judgemental — too critical? Would you envy the Walker — an individual who takes time to exercise his physical self each day and have some alone time? Or would you look at him with sorrowful curiosity? If I had to be in his walking shoes, it would be torturous to walk the solitary road. Because I adore companionship and interaction with others and thrive on that. For I feel we are meant to engage with others. I feel it is so barren to go through life unaware of the beauty and connection that is here in this physical plane. Yet, for The Walker, who truly knows? Maybe this solitary walking is his salvation, his time of meditation… I will never know as he chooses not to share words with anyone along his daily path. As as for yourself, do you too often find yourself walking (or even “sleepwalking”) through life, oblivious to all the possibilities and opportunities that surround you? Do you become so singularly intent on getting somewhere, accomplishing some goal, that you don’t enjoy the beauty of the actual journey? I respect the life path of others — striving to be understanding and non-judgmental. I enjoy my solitary time where I can connect with nature and the elements. Here I am — a Reiki Teacher and Practitioner — you would imagine that my life is very tranquil, organized and filled with much meditation and peacefulness. However, the reality is that I live on super-busy Long Island, NY and my life has become exceedingly full. Think of that saying “too much on my plate.” Because that is how it sometimes feels. Some acquaintances and very extended family think that because I do not work at a corporate, full-time job, that I am the equivalent of being “retired.” Nothing could be far from the truth of the busy-ness of my days. And I still need to earn a living. Mindfulness. Meditation. These are two significant concepts and practices that are extremely helpful for keeping that sense of peacefulness within, despite what is happening in the outer world. It keeps my inner world more balanced and joyful. Easing yourself into even five to 15 minutes of quietude and solitude can be incredibly rejuvenating! So don’t underestimate the power of taking ten minutes to tune out the distractions of the outer world and turn your attention to creating calmness within. In fact, taking some time for this is vital to your well-being. A nature break is always soothing — observing a serene view, feeling the wind against your skin, watching the soaring of a bird, or anything that captures your attention and your vision. There is a new theory of well-being and aligning with nature — it is called grounding. Which refers to literally placing your bare feet on the ground — soft grass, soil, sand — so you can directly connect with Mother Earth. Obviously this is something to do in the good weather. I have been indulging in walking and sitting barefoot in the newly sprouted lush green grass in my yard. And it has been exquisitely satisfying to just dig and roll my toes in the grass and feel rooted to Mother Earth. And very invigorating! If it is not always possible to be with nature, you can always tune into some slow, deep breathing wherever you are. These kind of intentional breaths bring our mind into the present, forcing us to connect with our own inner rhythm in a positive, calming way. When the pace of life feels frenzied, you can be mindful in the present moment while cooking, washing dishes, brushing your teeth or doing simple tasks. That means focusing on that task completely, not letting your mind wander back to the past or into the future — or anywhere else but where you are at that moment. Ultimately life does not always go the exact way you want it to, but the essential joy is to find the glory in each moment. If you search with a believing, trusting heart, you will find the blessings all around you. Teach yourself to tap in to each moment with your focused attention. And you will feel the better for it. I strive to practice mindfulness consistently, tuning in to each moment with pure and nonjudgmental attention. I enjoy connecting with nature, tapping in to the radiant, grounding rhythms of Mother Earth. Spending moments in stillness and quietude are so rejuvenating and healing for me.